Drilling a borehole in complex geology requires continued adjustment in order to reach one or more reservoir targets. PetroNOC brings all your data together in one place, giving your team shared access to the real-time information you need to keep your well in zone and on target. 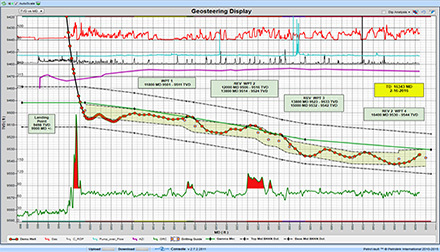 We provide key drilling and geological data for the engineering and execution of the ideal well trajectory through a solution that allows drillers, geologists and other key players to communicate between the rigsite and the office with ease. 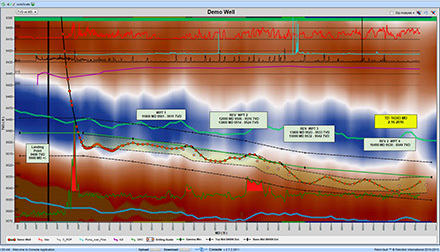 PetroNOC's data aggregation from MWD and LWD tools, as well as from mud logging systems, allows visualization on single plots. 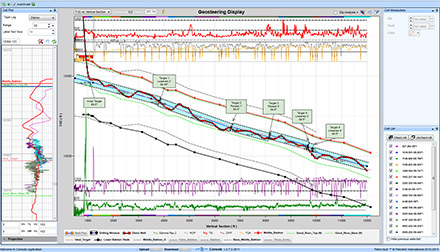 We analyze all relevant information including images related to directional and electric logs, azimuthal and inclination measurements, and other real-time data. All of which leads to faster, more informed decisions. We provide multi-well oversight from a single location, with the ability to easily switch from one well to another and input comments on screen to share information. If needed, we can provide the services of our Geosteering Specialists to help enrich your well plans and ensure the correct borehole positioning.